The two PMs also stressed the need to work towards ensuring the maritime safety of the Indian Ocean. 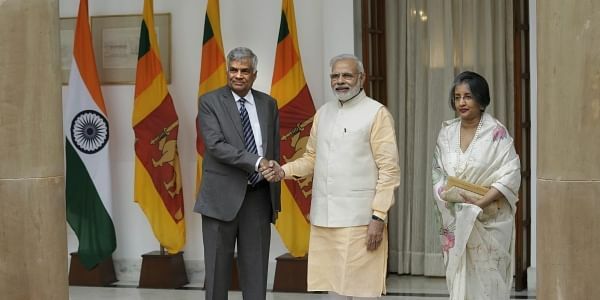 This was stated in a press release from the Sri Lankan Prime Minister’s office, following a meeting between Prime Minister Ranil Wickremesinghe and his Indian counterpart, Narendra Modi in New Delhi on Wednesday. The two Prime Ministers agreed to make the South Asian Association of Regional Cooperation (SAARC) an effective bulwark against the menace of terrorism and to get elected representatives of member countries to play a role in enabling SAARC to realize its full potential. A wide range of issues ranging from defense cooperation to economic ties, investment and trade in services, was discussed. Although the Sri Lankan Foreign Ministry had put out a statement virtually supporting India on the issue of the cancellation of the 19 th.SAARC summit in Pakistan at the behest of New Delhi, Prime Minister Ranil Wickremesinghe said in Auckland ,New Zealand that the indefinite postponement of the summit was regrettable and that SAARC summits should be held. Wickremesinghe said that SAARC has a useful role to play and suggested measures to make it an enduring entity, but at the same time he also warned that Sri Lanka will have to look for other options if SAARC fails to deliver the goods to the satisfaction of its members. This was a message to India which is generally thought to be unhappy with SAARC’s formation at the behest of Bangladesh. Sri Lanka is also unhappy that SAARC has been held hostage to India-Pakistan rivalry and conflicts. The Sri Lankan Prime Minister has also been touting the idea of developing the Indian Ocean region in which he feels, Sri Lanka can play a central and critical role given its geographical and strategic location. Though under pressure to respond strongly to Pakistan’s provocations through the activation of cross border terrorist attacks, Indian Prime Minister Modi responded favorably to Wickremesinghe’s proposals for ensuring the survival and viability of SAARC. He also welcomed the idea of developing the Indian Ocean as the new economic zone in the Asian region. Significantly, the two Prime Ministers discussed the controversial subject of trade in services. While both are keen on the inclusion of it in the proposed Economic and Technical Cooperation Agreement (ETCA), there is strong opposition to it from Sri Lankan professionals.